This dynamic and edgy global model will be built here in the UK, Swindon in fact, and gives the Hond Civic 2017 an even more appealing and accomplished build. Sleek and smooth lines run the full length of the body, giving the all new Civic its effortless and dynamic character. Blacked out detailing enhance the sleekness of this car, the honeycomb lower-grille below the wide bonnet grille and the aggressive bonnet creases are a smart addition to the sharper resculpting of the car. With standard LED running lights and mirror integrated LED signal lights the vehicle becomes even more noticeable, always letting those around you know you’re there and what you intend to do next. The resculpting continues round the back and sides, sharp smooth lines, standard 16” alloy-wheels, LED tail lights and a LED integrated wrap around rear spoiler as we make the new Civic more commanding and edgy, keeping heads turning with its sporty presence. This smooth detailing is not all about the look of the car though, all of these new sleek and integrated features add to the class winning aerodynamics of the vehicle which enhance the actual drive and handling. A ride that is just as smooth, sleek and powerful as its body is something that the designers of the new Civic were aiming for and they really came through! The new stiffer chassis (52% stiffer than before) and new multi-link rear suspension ad to the increased grip of the new Civic, adds to the reassurance and quality of the drive. The new civic even comes with the option of adjustable suspension to give you a firmer and sportier ride. Chief Engineer and Global Project Leader, Mitsuru Kariya, has summed up the overall styling, saying that the charisma “has to come from more than the styling, the athletic external appearance must allude to the dynamic attributes and technology that lie within”. And this really does prove true. The interior design is definitely focused on the driver, a clear effort has been made to connect you to every aspect of your drive and all your connectivity and intuitive features are really easily accessible. Crafted to keep all you’ll need at your fingertips, the dual display dash ensures that all your essential details and info are in front of you. Fuel, speed and revs are mounted directly in front heads-up display, keeping key driving details easily viewed and giving you a safer drive, this, along with the steering wheel controls, mean that control and access to the environmental factors of your drive are literally in the palm of your hand. Where the interior design and textiles are concerned the Civic has been stripped back and refined, smooth dark textiling with chrome edges keep up with the agile and dynamic spirit of the hatchback and sculpted chairs make sure that you are positioned and secured in the most comfortable and supportive way. The dashboard is made up of contrasting material, a tiered dash and surrounded by solid and secure details, creating a well built and well designed feel, it really matches the interior to its strong character.The seats are very cushioned and supportive and there is a lot of in-cabin storage. In the back, the extended wheelbase means there is plenty of legroom. The boot boasts a 478 litre capacity (98 litres more than a VW Golf) with 70 litre underfloor storage too. The lowered driving seat means the loss of the ‘Magic Seats’ seen in previous models, but practical changes have made up for the loss. Things like the wide boot opening, low loading lip, and a tonneau cover are all touches that make the boot space a really positive feature. Over all the interior of the new Civic is all about the driver, fully focused on comfort and practicality with no compromise on the smooth and dynamic styling. The main feature of the Civics tech is the Honda CONNECT and audio information system with great connectivity features. Using wi-fi tethering this amazing little feature keeps you connected to all your online music and media, it also has Bluetooth connectivity, which allows you to to connect your phone up directly to your car. The touch screen display has different options, for example the Phone Menu allows you to browse contacts, select call history and dial your friends. The built in AHA app option allows you to connect to internet radio, access your social media accounts and find nearby restaurants and hotels. You also have a pretty unique triple instrument driver display, with a space age feel the digital display is fully customisable and can do things like integrate with your smart phone. A diesel engine will be available later in 2017. So far, we know that tim levels are going to start from S and move up to SE, SR and then EX. 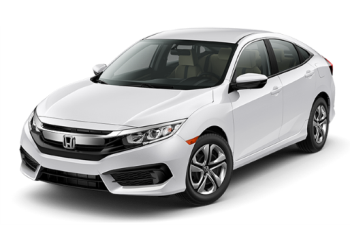 No exact equipment levels have been announced yet though we do know that the Honda SENSING suite is fitted as standard, a move which has secured the new Civic a five-star safety rating from EuroNCAP.. The type R is expected to be revealed at the Geneva Motor Show in March, a car that only sets the highest of standards and has already claimed the title of the What Car? Reader Award having been so successfully received at the Paris Motor show in September. And you can totally see why, just check this video out below. The Type R is truly breath-taking and also vaguely reminiscent of the Batmobile with its sharp, stacked and aggressive lines. Along with the addition of the Type-R we will be seeing the later addition of the Diesel engine. Honda are also talking about putting a hybrid option into the mix to compete with the Prius.